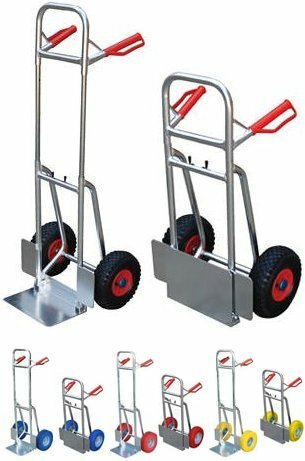 Strong, yet lightweight aluminum hand trucks have a collapsible frame and folding nose that allow them to be stored compactly in the trunk of a car or the back of a van. 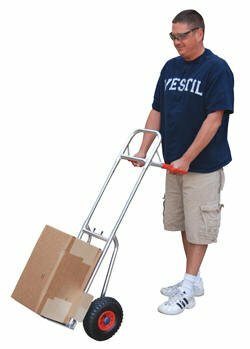 Telescopic uprights adjust easily using a spring-loaded locking mechanism and the 11-¾"W x 8-¼"D noseplate flips-up for convenient storage. 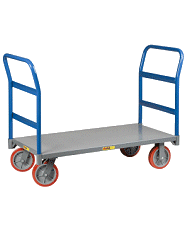 Hand trucks include wheel guards for moving oversized cargo.